Pots and Tea: Is it good for my cakes? Is it good for my cakes? This question probably goes thru heads of all of us - certainly time to time. I mean all of us who like puer. I have to admit I am still not sure about my care. I am still learning -Learning by listening to more experienced, by reading different opinions, by smelling to my tea. Learning from listening to intuition. But I am not looking for the one and only answer how to age my tea. I see it more like adventure road with questions and experiences. 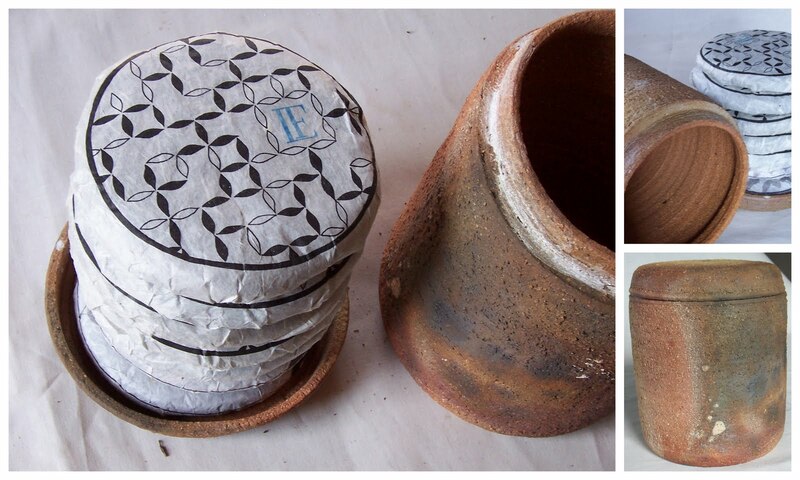 From the last firing of our wood kiln I have new arrival in to my tea cupboard. It was born in the right time - my older jars and wooden boxes filled to their tops and new cakes arrived. I fill my first stoneware jar with fresh sheng almost two years ago. During those months the teas stored there have moved very nicely. It is hard to compare this tea with tea carried in wooded box (my second option) or with cakes stored only in paper wrapper (my third option) but I find several benefits. The most important merit for me is protection. One tea teacher told me that the protection is too tight. He told me that as we have rather drier climate here it is better to let tea take some moisture from the air. But I find out that in unglazed clay the tea creates kind of microclimate and moisture is more stable -it is not going up and down because of wetter or heating so quickly. As many potters I also keep for myself pieces which have some imperfection but are too good for hammer. And it was also in the case of the new jar. You can see on the picture below how the rim of the piece is deformed. The lid was fired on the jar so I can close and open it but only in one position. It has moved because it was fired lying on the side and the rim was too thin. The clay is porous. We buy this rough clay from factory which produces chimney flue blocks. As this clay has very low shrinkage - Mirka usually use it for bigger or irregular shaped bonsai pots -this clay survive more then rest we use. When pieces are unloaded from the kiln we clean piece after piece by water and fine brush paper. So before I put cakes in to the jar I have let it dry for a two days. None the less day after I putted cakes there I measured out 88% of relative humidity. (In side of the jar) There was still too many water in it! After another two days it went down to agreeable 55-65%. We moved to our new place during the last autumn and moisture has been in borders which I feel are good for the storage. For sure it is better then in too dry house were we lived before. Only temperature during winter was to low -but I am going to buy more wood for our heating this time. And hopefully next winter the temperature will be more comfortable for us as well as for tea. I look forward to see changes on my hygroscope during seasons as well as changes in teas inside my jars. Thank you for reading. Enjoy your teaday. You sure stocked up on tea cakes! I have been reading your blog from beginning to end and it fascinates me. It is great to read tea from the potter's perspective! Thank you for reading, Billy. With Puers, it is not easy to define "to be stock up" . There is still fight inside of me if I should buy smaller quantity of well aged guy or rather bigger amount of good but always cheaper, fresh tea. Does the tip of the spout of your pots help with the flow? Thank you for reading. If you have any thoughts about storage in ceramic please feel free to share -your experiences are appreciated. I just found your blog. I LOVE the look of the teapots. That roughness is fantastic! Thank you.I glad to see you here.